Salomon van der Sluis, one of ten children of Mozes van der Sluis and Schoontje Godfried, was married to Eva Roos, one of ten children of Mozes Roos and Anna Vroom, residing in Staphorst. Salomon was born in Meppel in 1867, his wife was born in Staphorst in1858. 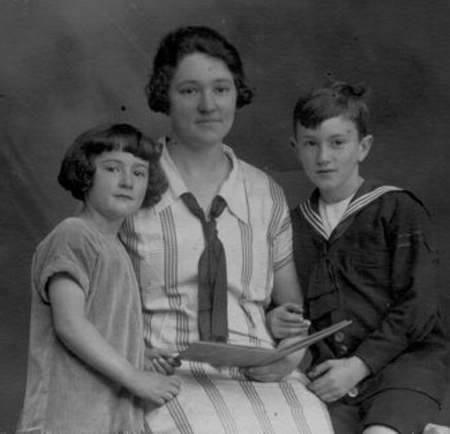 Salomon and Eva had two children: Anna (born in 1891) and Mozes ( born in 1893). Salomon was one of the four brothers who had a butcher’s shop on the Woldstraat. They were energetic people and the butcher’s shop in no time expanded and became a slaughterhouse for exporting meat, employing 25 people. Since the export of calves was mostly done by train (later by truck) it was obvious that, when the premises on the Woldstraat became too small, the slaughterhouse was established near the station and the main road at 28 Ezingerweg. At the start of the war, the slaughterhouse, owned by the ‘Gebr.Van der Sluis’ (Van der Sluis brothers) was still a thriving company. The Second World War changed everything. In the first place, there was the butchery. This Jewish company naturally suffered during the War. In the first instance the Jewish owners Salomon and his son Mozes van der Sluis were laid off. After that the Germans tried to sell the company to a third party at a very good price. Without success, so the butchery was liquidated on the 20th of January 1944 and the machines and premises were sold. What happened to the family? Eva died at the beginning of the war on the 26th of June 1941. She was buried at the Jewish cemetery in one of the two graves that the family had bought. But her husband was not to be buried next to his wife. Eva van der Sluis-Roos, Salomon’s wife, died in 1941. Salomon, who was 75 years old then, stayed alone in the farm style house at 76 Woldstraat. The time he had left to would not bring him much pleasure. At the beginning of 1942, he came into contact with the Meppel police, concerning a girl. Just at the wrong moment! Luckily for him, it blew over and he was not convicted. On the 27th of September 1942, things became very serious. He received a notice from Mayor Wisman requesting him to vacate his house on the 1st of October, because the house had been confiscated by the Wehrmacht (German army). At the same time, he received a visit from a number of Germans and policemen who made an inventory of his possessions to prevent Salomon from ‘pinching’ something. In Salomon’s house on the Woldstraat  after the Wehrmacht had left  Meeuwis van Dijk took residence. An interesting option for the Van Dijk family, since they had a café on the corner of Woldstraat and Touwstraat, and had a lot of farmers as their clients. Salomon’s house had a big stable, which was then used to keep the horses belonging to the farmers who visited the market or came for other business to Meppel. Salomon had to find other accommodation. Luckily his daughter Anna and her husband (textile trader Roos) and children lived close by. There he spent the last days of his life. Indeed the last days of his life. 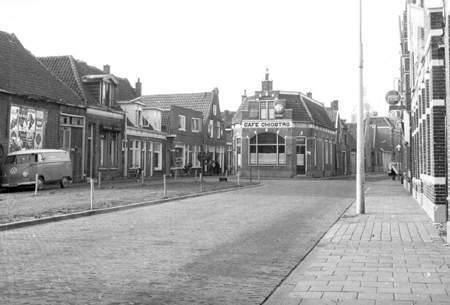 In the night of 3rd to 4th October all Jews were taken from Meppel, including the occupants of 6 Woldstraat, where Salomon, his children and grand children lived. The whole family came to Westerbork on the 3rd of October. They stayed there for two days and were then deported to Auschwitz on the 5th of October. Salomon van der Sluis, Anna van der Sluis-Roos, Abraham Roos, Eva Roos and Rudi Roos died on the 8th of October 1942. His son Mozes did not survive the War either; he was killed on the 7th of May 1943 in Sobibor. Betje Roos and her children Nanny and Salomon. 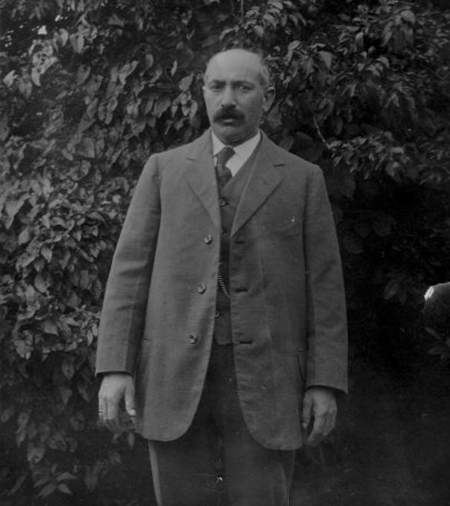 Mozes van der Sluis married Betje Roos, one of nine children of Abraham Roos and Sara Frank on the 14th of June 1916. The couple had two children: Salomon (born 1917) and Sara, who was later named Nanny (born 1924). Mozes and Betje divorced and Mozes soon moved to Apeldoorn. 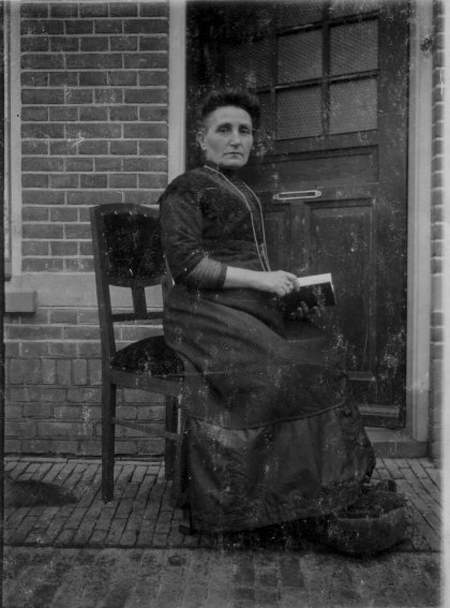 Betje remained in Staphorst with her two children and her brother Emmanuel (Manuel) Roos on Staphorsterweg (now known as Werkhorst), in a house located in what was then called ‘Tuindorp’, now known as Reestplantsoen. As a young man Manuel had been employed at the office of the firm of Houwing in the Hoofdstraat, but when the war broke out he was a sales representative for the firm of Hertzfeld who were in the spice trade. Shortly before he had to report, he came to say goodbye to a colleague of his who also lived in Meppel, a Mr Feddema who lived in Ambonstraat. A son of the latter remembers that Manuel was very emotional during this visit. On the right: Manuel Roos during his work at the firm of Houwink on the Hoofdstraat in Meppel. By mid-July, Salomon together with the other young Jewish men from Meppel was transported to Linde. Only a day later, he had to go to Westerbork. Manuel went to the labour camp Conrad in Staphorst. Betje Roos and her daughter Nanny went into hiding. A neighbour warned them when she saw a group of Jews from labour camp Conrad her brother Manuel was probably part of this group- walking past her house on the way to the station in Meppel. Betje left for Zwolle and went into hiding there. Everything went very fast. A few days after mother and daughter had disappeared, the boy next door heard the dog of the Roos family making a lot of noise. He told his father and together they went inside through the backdoor of the house of the Roos family and only found the dog. The dog, covered in fleas was taken to the asylum. Sara van der Sluis, born in Meppel on the 20th of July 1920. They left Staphorst to an unknown destination without the required permission for a change of address, so their arrest and appearance in court is requested. Two Jewish ladies who returned to Meppel when the war was over. Left: Betje Roos and Roos Wolf. 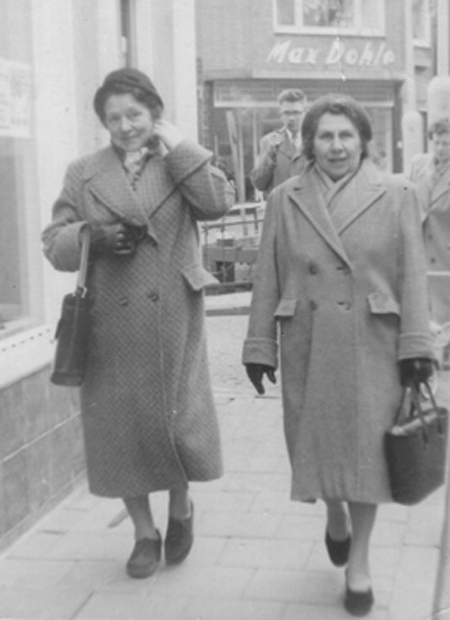 Betje and Nanny survived the war and returned to Meppel and tried to resume their lives. Betje went to live in a house on Werkhorst; Nanny married Benjamin Mendels (more information under ‘Mendels Family’). Betje Roos was buried at the Jewish Cemetery, contrary to her father-in-law Salomon, who remained separated from his wife ‘for once and for all’. For a long time she was the last Jewess to be buried in Meppel. On the 24th of August 1942, Mozes van der Sluis was transported from Westerbork to Auschwitz where he was killed on the 30th of September 1942. Manuel was killed somewhere in Central Europe on the 31st of August 1943. Nanny and Sal van der Sluis, photographed mid-1942. to work at Camp Conrad in Staphorst, in July 1942. 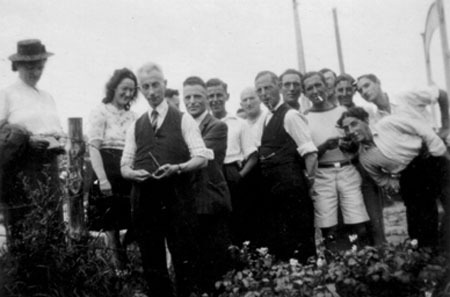 Manuel Roos (4th from the left) and his niece Nanny van der Sluis among other prisoners in labour Camp Conrad.